As we start getting back into fall and a routine (as we talked about last week at the podcast), I wanted to share a bit of encouragement for all of us today. Who doesn't like to be encouraged? Our time today is just a reminder that no one out there has it all together. We are a continual work in progress in the Lord's hand. If I shared only what I had mastered on this podcast, it would be non-existent ;). So today listen in and be reminded that no one has a perfect marriage, family or home while living on this fallen earth but that doesn't mean we just throw in the towel and stop trying. I'm reminded and reminding us today of God's Word to persevere and work heartily as unto the Lord, and this includes my normal day to day life of caring for a home and family. 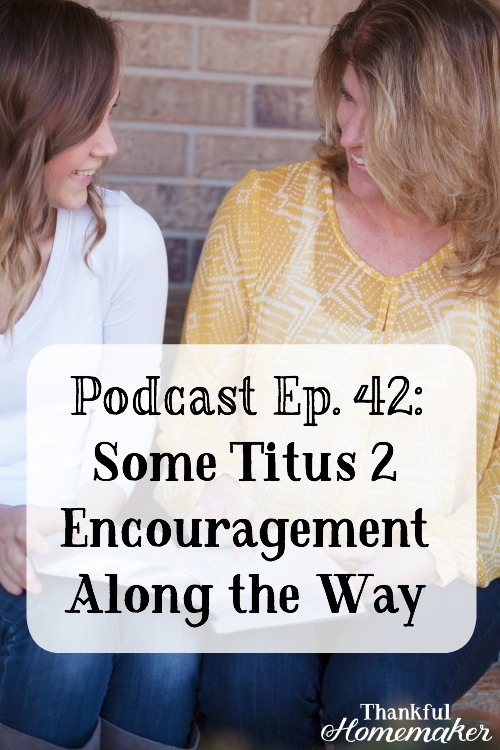 In the spirit of Titus 2, I want to be an encouragement in the areas of loving our husbands and children, being keepers of our homes, being self-controlled and submissive to our husbands so God's Word will not be reviled. We need to share our struggles but not leave each other there. But we need to spur one another on to love and good deeds. My hope always is to point one another back to Christ and to live by and abide in His Word. Come listen in with us today. My greatest comfort in this world is that Jesus Christ is enough. He is enough on the days when everything goes wrong and on the days when it seems that everything is falling apart. There is no greater news than I have been forgiven. I am a child of the King, my sins have been forgiven, and heaven is my eternal home. This great news keeps my eyes on the eternal and reminds me of the important calling I have from the Lord as a wife and mother. Don't look outside the walls of your home to find your purpose – look to the Lord Jesus Christ. May you gain your strength from Him to love and serve your family to His glory. « Where is My Hope?